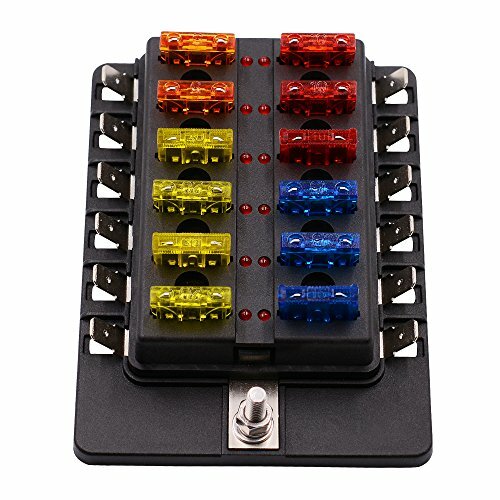 【Product range】: can be directly connected to any electrical appliances of the car or boat (such as: roof lights, car headlights, as wide lights, fog lights, warning lights, car refrigerator, car charger, car fan, car TV, etc. It's more safe to place a fuse box!When circuit is abnormal or fails to work,the current will get high.It will cause damage to the components,and may even cause fire.This fuses protect the electronic equipment from this damage,and avoid serious damage caused by the internal fault of the electronic equipment. Each fuses has a rated specification,when the current exceeds it,the fuse will be blown.If place the fuses correctly in the circuit,the fuses will be blown theirselves when abnormal current increases to a certain height and garantee the safe operation of the circuit.